We build production lines and assembly devices designed in accordance with the Industry 4.0 standards. 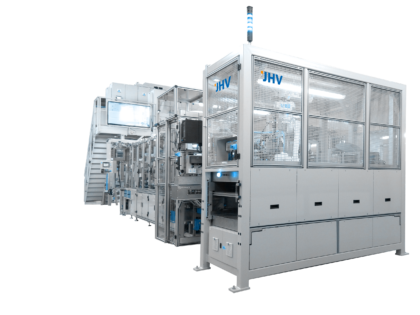 We create the most cost-effective automation solutions thanks to the close cooperation with the customer starting at the preparatory stage of product manufacturing. 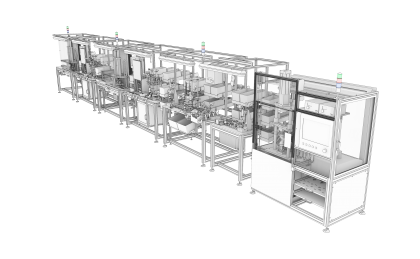 This type of production lines is suitable for smaller production capacity, as well as for the cases of limited possibility of employing industrial automation to insert and manipulate with the parts. The production line is therefore designed primarily as a manual production line with several workplaces for operators. The typical capacity is 15-30 workers, depending on the number of assembled components. This lines are typical for large lot production and production processes requiring large share of automatization. Asynchronous lines allow the production and assembly of a larger number of parts. The key advantage of these lines is the flexible stock of parts in front of individual workplaces, and the part´s transporting on assembly pallets or conveyors, allowing high line speed. 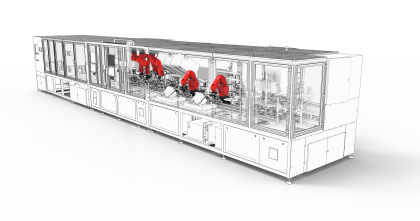 The key current trend in Industry 4.0 is a fully automatic robotic line. Predominant use of robots for assembling satisfies 24/7 production requirements, allowing the flexibility of production. We offer these lines with all types of robots, depending on the requirements.